Rodents are characterized by two growing incisors in the upper and lower jaws. The incisors grow continuously (5 inches per year) and must be kept worn down by gnawing. Rats have keen sense of hearing, smell, taste and ability to swim. They are able to gnaw through concrete, wood, and floors. Rats can spread disease and carry parasites such as fleas, ticks and lice into your home. 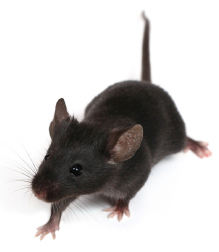 Mice are small rodents weighing less than one pound. The most common are the house, deer and white-footed mouse. They are known to invade homes for food, water and shelter. They can produce offspring rapidly, breeding 5-8 litters per year with an average of 5 pups per litter. Mice have a keen sense of hearing and smell. They rely on their smell to locate food and avoid predators. Mice spread disease through their parasites and feces.